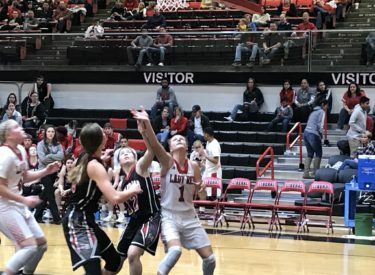 The Liberal Lady Redskins handled Great Bend Friday night in the Big House 57-38. The third ranked Lady Redskins stay on top of the west half of the 5A standings and keep pace with first place Hays in the WAC. Liberal and Great Bend were tied 6-6 after one quarter. The Lady Red outscored the Lady Panthers 21-10 in the second quarter for a 27-16 halftime lead. The lead ballooned to 45-22 after three. The biggest lead was 28 at 50-22. Machia Mullens dominated the paint with 18 points and nine rebounds. Katie Horyna had 12. Audrey Gilmore added 11 and Aubrey Warden had her best game with nine points. Liberal is 13-1 overall and 3-1 in the WAC. Great Bend is 3-11 and 1-3 in the WAC. Hays is 4-0 in WAC after their second overtime WAC win of the season 50-47 Friday night in Dodge City so LHS is one game out of first. Liberal hosts Guymon Tuesday night at 6 in the Big House with Redskin Pre-game at 5:45 on 1270 and kscbnews.net.